Alright folks, it’s time for a post that’s been a long time coming. 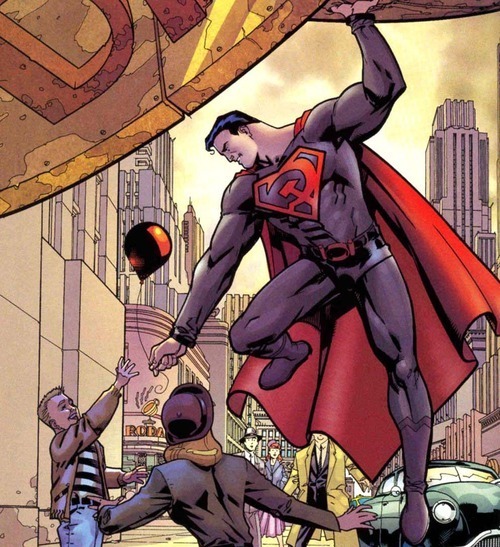 My read pile review of Mark Millar’s Superman, Red Son mini series. I actually finished reading this 3 issue “Elseworlds” story sometime back in March, but I’ll be honest that I really have been dreading writing this damn thing since then. Not to say that the series was that turrible per say, but like most things DC, there’s just a very limited appeal for me, so it’s hard to get juiced about anything I read from that House of Shlubs. Especially any books about Superman who I personally feel is probably the lamest superhero on the face of the planet. There I said it. It’s a feeling shared by many in terms of his white bread cookie cutter mentality with a list of powers that makes him invincible to everything…including dramatic tension. But given that this blog is pretty Marvel heavy at times, and my fellow Ghostie, Rob Stewart, will give me grief sometimes about me not being more friendly to the group of basement dwelling mutants that are DC fans, I am including this review as my charitable contribution for the year. A Soup Kitchen hand out as it were. Plus after we commented on this book in our last Superman centric podcast, I thought it would be cheating not to finally post this. 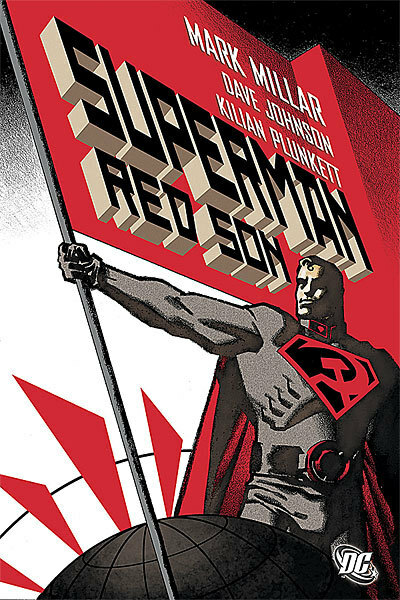 As stated above, Red Son is basically a “What If” tale based on the premise that instead of the Kal-El crash landing in the rural fields of Kansas and thus growing into the living embodiment of “Truth, Justice, and the American Way”, he crash lands as an infant in the farm fields of some Soviet Block country and thus grows up in Stalin’s Russia. Given what’s been going on in current events with Russia and the Ukraine, I thought it was the perfect time to read this Eastern Bloc saga, as some of the old Cold War sentiments and rhetoric have been buried for so many years have recently came bubbling back to the surface, making the whole story a little more relevant than it might have been even a year ago. And for the first part, I was right. The beginning of the tale does fashion an interesting take on the story of Superman vs. his arch enemy Lex Luthor, to be one of high stakes oneupsmanship in the realm of geopolitics. Superman is cast initially as simply a nuclear deterrent, a kind of super weapon that USSR can use at any time, for which the USA has no real answer for. Luthor starts off as your standard military industrial complex scientist tasked with coming up with a counterbalance for this new threat against Post WWII American hegemony. That is until Superman really starts imposing his own will on the proceedings. In an important twist to what could have been a one dimensional tale, Superman starts acting more and more like the Superman we know. He doesn’t care about politics or boundaries or nation states. He cares about the people, and wants to help everyone in any way he can. Instead of being some cold war flunkie, he marches to his own tune and it’s a tune most people are grateful for. This generosity and altruism of course tweeks Luthor’s nose as it does in the normal universe, and his massive ego gets the best of him. He then proceeds to go all “bad guy” on us: killing most of the people at his military think tank before going off the grid as it were to wage his own personal war on Supes for what amounts to be just about pride. Supes of course answers in kind by just doing more and more kind things, winning hearts and minds for communism not through force or intimidation but just by example. Of course, Stalin takes full advantage of that while he’s alive in terms of pushing his own agenda, but soon the dictator bites it and Supes is proclaimed the new leader of the USSR. That’s when the whole book takes a huge swing. Supes starts wanting to help more and more people, and that somehow equals setting up more and more of a big brother police state. I’m kind of hazy on the details as to why the one would automatically lead to the other to be honest, but evidently just being a communist automatically means you’d be more authoritarian. Its a very weak premise that I still don’t get, but the writer ran with it. So Supes is running this totalitarian utopia, complete with lobotomies for those that are in non compliance, and in comes Soviet Batman. Because of course Batman would come from the same country as Supes. Forget the fact that the only reason Supes ended up in Russia was because of a twist of fate, lets make Batman also have his origin in the same country because…well…American Batman with Soviet Supes would just make too much sense. So let’s run with this. Make everyone Soviet. Done. Anyways, Soviet Batman is all kinds of waging war on Supes utopia, creating havoc and terrorism for no other reason that for anarchy sake. Yes, folks, Batman doesn’t really have a plan other than practicing austerity, eating potatoes, drinking vodka, and blowing up stuff. That is until Luthor says he’ll help him kill Supes with a strange super plan involving red spot lights and some sort of huge bomb. The damn thing actually almost works too, that is until Soviet Wonder Woman (yes, there’s one of those too) and saves Supes bacon at the cost of her hair turning white and becoming a bitter old spinster. At least that’s what seems to happen. I’m not sure. I know she’s in love with Supes, but I guess he just uses her affection to get what he wants? Again because he’s a communist and that’s what they do? I think that’s the underlying message. Whatever. Flash forward another 20 years, and Luthor finally gets the drop on Supes with an army of John McCain style “tortured at the hands of the Viet Cong” Green Lanterns (at least they weren’t Soviets too). This leads to the realization that it wasn’t communism that was driving Supes do to all these things…it was Brainiac? (yeah that’s convenient). So then Supes has a change of heart, sees what a douchebag he is, fakes his own death in some ultimate form of self sacrifice. Luthor free of Supes “interfering” and now able to let his ego go full tilt, does a ton of really nice things like ending war, disease, and even old age. Why he couldn’t do these things while Supes was alive, I have no idea, but again it’s something about his ego being center stage. That he has to be the most important person in the world in order to do the most important things. And in the end, Earth actually becomes the New Krypton and tens of thousands years from now, a Superman like baby is sent rocketing away from Earth to some other new place to help their civilization. Wow…that’s a mouth full. A hot smelly mouth full. It wasn’t until I started writing all this out that I realized how dumb this whole premise was. Again, I still don’t understand why Batman had to be Soviet, nor why Supes would want to be anything else but a really nice guy that kept to himself despite being raised in the Soviet Union. In the end though, I can think of only one answer: Mark Millar. Yeah, that guy. After now reading a bunch of his stuff and not liking any of it, I think I know the reason why. He excels at making beloved super heroes douche bags for no other reason than that’s what he wants to do. He did it with the Fantastic Four, he did it with Iron Man and anyone in the Pro-registration side of the Marvel Civil War, and he does it in this story with Supes and Bats. And sure that might be good for those that like to destroy rather than create, but for me, it rubs me the wrong way more times than not. Yes, I really feel as if all Red Son is about is taking the interesting premise of a Cold War Superman and using it to deconstruct a legendary hero and make him be a colossal jerk. It has nothing to do with politics or world view points. Millar wants Supes to be Hitler and that means he should be communist. And it’s just not Supes that suffers. I mean Millar takes everyone in this book and drags them through the mud until they come out the other side looking like a piece of human crap. That goes for heroes, villains, hell even Lois Lane is portrayed as a petty pessimistic waste of oxygen. I know all this is harsh, but its the way I feel. Some comic book readers love this stuff. They eat it up with spoons and give high praise for Millar “modernizing” the characters for more hipster sensibilities. I personally think it’s disgusting and disrespectful, and Red Son is another example of it. Why Soviet Batman? Really? 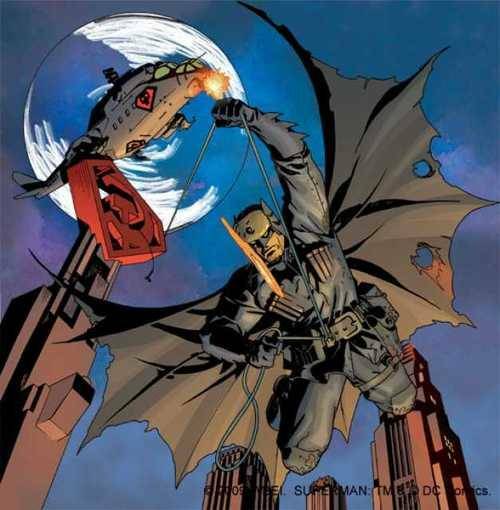 Why does Supes landing in Russia automatically make Batman also have to originate there too?